The following collection of equipment is for associated applications (i.e. Paper Roll Hardness) and materials (i.e. rock, paper). They all offer the same high level of quality and utility as the rest of the PCTE's range. PaperSchmidt is the first rebound hammer designed specifically for roll hardness testing. A new measuring principle and a high compliance plunger provide roll-profiling accuracy and repeatability that was un-achievable before now. 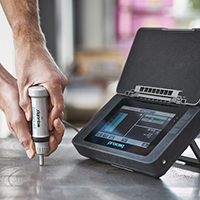 The Equotip 550 provides the user with a highly portable, accurate tool to test hardness. Designed for the hardness of metal a new application is rock UCS and logging rock core sample is becoming popular.